Retaining rain water in rain barrels is a good way to be more self sustaining. The water can be used to water the garden, indoor plants and herb garden, sustain a decorative pond, launder clothes and toilet flushing. Some “green” houses have a rainwater collection system to run the laundry and the waste water system of your home. Rain barrels are a good place to get started and can collect rainwater direct from the gutter system on your home or barn. There are rain barrels to match or blend in with every decor. The include a screen on the top where the water comes into the barrel from the downspout of the gutter. This screen catches the insects, leaves, twigs and other debris. 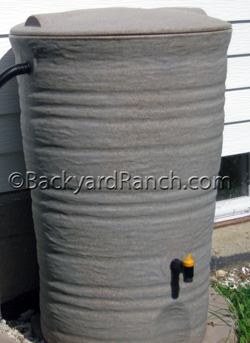 The rain barrel includes a drain plug for easy cleaning and a spigot to connect the rain barrel to a hose for rainwater use. Rain barrels are not only a way to be more self sustaining, they can also: lower your municipal water bill and water usage, cut down on sump pump usage and ground water drainage around the foundation of your home, be a good way of water conservation. A common sized home gutter system can fill a 50 gallon rain barrel under each downspout with less than an inch of rain. kind of barrel we used to make the homemade hog waterer. Make sure to clean them thoroughly before use with a light bleach solution. Several barrels can even be linked together for extra holding capacity. The barrels also come in several different sizes. Rain barrels of any shape, size and color can also be purchased online or at several local hardware or farm and home stores. Rain barrels can be placed around the home, barn or other building. Rain barrels take very little maintenance. In the winter, you will want to drain your rain barrel before the first hard freeze. Open the spigot and turn the barrel upside down for winter storage as to not collect debris. When you set up your rain barrel for use again in spring,make sure that the barrel is clean. Make sure to direct your drain plug and spigot away from your home foundation.